Where Do Sisters Come From? Beza lel Books — Many young girls have never had the pleasure of meeting a religious Sister. This beautiful introduction to the religious life for young girls and their families explains the important roles Sisters perform in our faith, whether in classrooms, hospitals, learning centers, or behind convent walls. Where Do Sisters Come From? addresses questions such as: How do young women become Sisters? What is their day like? Where do they live? What do they do for fun? A gem of a story your whole family will enjoy. Testimonials for Where Do Sisters Come From? What a beautiful glimpse into religious life for young children! I think parents and teachers would be delighted to have it on hand. Only God knows how many religious vocations might be encouraged by this lovely little book! In this charming book, Elizabeth Ficocelli describes the call to religious life with clarity and simplicity. This book can begin to help every young girl discover God’s beautiful plan for her life. This book is fantastic, and I highly recommend it to anyone who wants to encourage their children to follow Christ. It is well written, beautifully illustrated, and fun for the kids. I encourage parents to read the original Imitation of Christ as well. Our children need this! Young girls today need a clear understanding of religious life so that from earliest years it can be a genuine consideration in answer to the proverbial question: What do you want to be when you grow up? A little book like this can be used by God to speak to young hearts in words they can understand. Come, Holy Spirit! 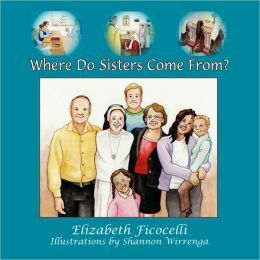 What a delightful presentation of religious life for children, beautifully, simply, and colorfully illustrated Where Do Sisters Come From? is a welcome, refreshing introduction that can encourage young girls to dream BIG of being a Sister! My church, St. Germaine in Prescott Valley, AZ, purchased 100 of your excellent books, Where Do Priests Come From? and Where Do Sisters Come From? and gave them to all the children that participated in our All Saint’s Festival in October. The children and their parents were so happy to receive them! We’ve also started a vocations committee at our church and are taking many steps to make sure that religious vocations and the information needed concerning them is made available to anyone who asks. The children and youth ministries are also getting on board, and soon we will be having Eucharistic Adoration for vocations and a traveling statue of Mary that can be taken home and the family will pray with her for vocations. Your little books have started an avalanche of activity at our church! Thank you for writing what the Holy Spirit puts on your heart! Purchase Where do Sisters Come From?